The utility of ultrasound to assist in the diagnosis and management of rheumatologic and musculoskeletal diseases is now widely recognized in the field of rheumatology, but few rheumatologists have the training to offer such a service as part of their practice. 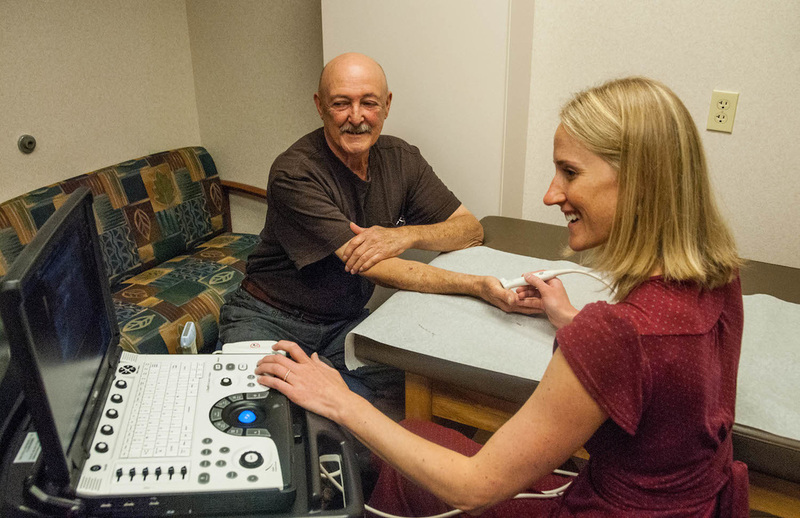 Dr. Amy Madison is certified by the American College of Rheumatology in musculoskeletal ultrasound, and she is currently the only rheumatologist in Bend, Oregon who is utilizing this beneficial technology. Some examples of how Dr. Madison uses ultrasound in her practice are listed below. Ultrasound can detect subclinical inflammation in joint tissues and tendons (inflammation not appreciated on physical exam or blood-work), which can oftentimes make the difference between detecting inflammatory disease vs. not. For example, some patients labeled with a diagnosis of fibromyalgia truly do have inflammatory disease that has gone undetected, and musculoskeletal ultrasound can potentially detect such inflammation, thus allowing the correct diagnosis to be made. Ultrasound can in some cases help distinguish between different types of inflammatory disease. For example, by evaluating what specific tissues or joints show signs of inflammation, ultrasound can help differentiate between rheumatoid arthritis and psoriatic arthritis, which are two types of arthritis that often mimic one another. Tendon injury or abnormality (eg rotator cuff tears, “tennis elbow,” calcific tendonitis, etc). By allowing Dr Madison to assess whether or not inflammation is present within the joints or tendons, the ultrasound examination assists with assessing disease activity and response to medications. For diseases like rheumatoid arthritis and psoriatic arthritis, the presence of abnormal blood flow within the joint, as detected by ultrasound, predicts joint damage and bone erosion (permanent damage to the bones). By picking up such a finding early, and treating appropriately, joint damage can be avoided. Ultrasound can be used to guide injections of the joints or tendons so that delivery of medication to the exact intended location in the body is essentially guaranteed. Also, by guiding correct placement of the needle during the procedure, any unnecessary discomfort is avoided. One common procedure performed by Dr Madison is ultrasound guided injection of the carpal tunnel for treatment of carpal tunnel syndrome. This procedure often allows patients to post-pone the need for carpal tunnel surgery, or in many cases, to avoid the surgery altogether. Trigger finger is another issue that can be treated by ultrasound guided injection, often allowing surgery to be avoided. It is much less expensive than an MRI. Ultrasound often allows for the diagnosis and management of a disease to be completed at the same time, saving the patient time and money. Where will I go for the ultrasound procedure? Answer: It is done with Dr Madison during an office visit at the Deschutes Rheumatology clinic. Answer: The cost depends upon the evaluation or procedure to be done, and so the cost varies widely. Most insurance companies cover most if not all of an ultrasound procedure. Please contact your insurance company prior to the procedure to be sure you know what costs you might incur. Answer: ​No. Unlike x-ray or CT scans, an ultrasound does not use radiation. It uses reflected sound waves to create an image. Can Dr Madison do an ultrasound of my back? Answer: ​Unfortunately, no. Dr Madison is not a back specialist and therefore she has not​ trained in evaluation of the spine with ultrasound, nor does she do ultrasound guided injections into the spine. Dr Madison practices ultrasound of the shoulders, elbows, wrists, hands, hips, knees, ankles and feet.